This is going to be a gigantic text post, you've been warned. Why am I posting about this six days before ALA? So that if you need to get something done, hopefully you have the time to do it. Also, please do note that this is ultimately a rehash of advice that you've probably heard before. 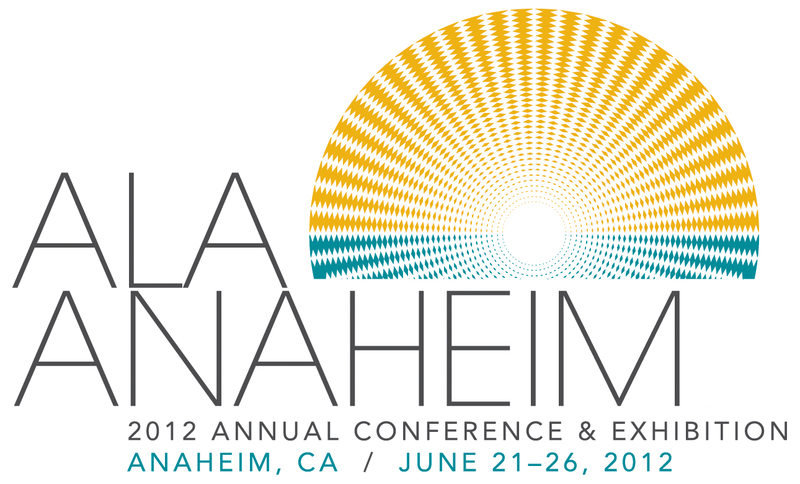 ALA (American Library Association) has two conferences every year: Midwinter (held in January) and Annual (held in June). The locations for both conferences changes every year. For example, this year Midwinter was held in Dallas, Texas and Annual will be held in Anaheim, California. In 2013, Midwinter will be held in Seattle, Washington and Annual will be held in Chicago, Illinois. ALA conferences, as you might've guessed, are focused on libraries. However, you don't have to be a librarian to have an ALA membership. 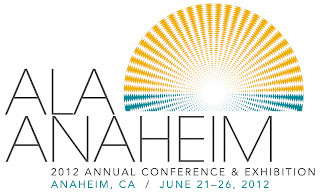 Also, you do not need to be an ALA member to attend ALA.
ALA Annual 2012--which is held in Anaheim this year--runs from June 21-26. The exhibit floor will be open from June 22-25. What should I bring with me to ALA? Comfortable shoes. If you're walking to Downtown Disney, running between the Convention Center and the parking garage, walking to get lunch, and so forth, your feet will murder you if you don't wear comfortable shoes. If you're prone to blisters or haven't broken in your shoes, bring band-aids and maybe some moleskin (not the notebooks, the skin tone stuff). If you're a blogger who intends to do some networking with other bloggers or publishers, business cards would probably be a good idea or maybe bookmarks. What do you want to have on your business cards? At least the basics: your blog name, your blog's url, your name, your e-mail address, maybe your Twitter username, and your job title (book blogger). I personally wouldn't list my address or my phone number on there--although maybe leave the back side of your business card blank so that you can write it down for them, should you need to/want to. If you don't have time to get them printed from an online service in time, you might want to look into local printing services or getting cardstock and doing it yourself. You're probably going to want to keep your hands free, so if you're taking a bag with you, a cross-body bag would probably be a good idea. You can bring a wheeled bag with you to put your books in, but you'll have to leave it at bag check as they are not allowed on the exhibit floor. Books are heavy. Also known as "your shoulder is probably going to hurt" or "best not to grab everything". I think the best rule of thumb is this: does it sound like something you're genuinely interested in or are you just picking it up because it's there? There will be swag... and tote bags. Which means that unless you've got a bad shoulder, you don't need to bring your own tote bags. There will be some available at booths, if you know where to look--or who to ask. Bring a snack with you or take a look at what's around the convention center so that you know where you'll be eating. If you're planning on eating at a restaurant in Downtown Disney, it might be a good idea to put in a reservation if you know when you want to eat. Why? Because the lines can be insane as people come out from the parks to eat (usually around dinner time in particular). It's never a bad idea to chat with publishers, librarians, or other bloggers. (Or book lovers for that matter.) Everyone shares a love of books and you never know, they just might recommend a book to you that turns into your next favorite read! There are two YA book blogger meet-ups that I know of on Saturday (one right after the other). The one that YA Highway and Stacked Books is hosting (here) and a more informal one beforehand at the California Pizza Kitchen that The Reading Fish and Reach for the Stars... and the Books! have thrown together (here). I'm definitely going to try to swing by both if I can--unless Saturday has completely wiped me out. Take one. Okay, that's a pretty general statement and I'm sure that this is something that we all know, but just in case, I'm going to say it: if you're going to take a book, only take one copy. I know, maybe you know another blogger who can't attend who is dying for the book that you too excited about or maybe you're contemplating a giveaway; but please, let's think about this. I mean, you'd be taking away a copy that a librarian could've picked up. I'm completely aware that this is hypocritical as anyone who isn't a librarian who attends ALA is, with this logic, taking away books from librarians--but it's not my point. Don't take more than you really need and you can always share your copy with your friend, right? Or maybe wait until the last day and if they still have copies available, that's the time to pick up a copy for your friend. As for giveaways, the best thing to do is give away the copy that you picked up to read. Read it, review it, and then give it away if you want to. A better idea might be to get in contact with your local librarian and see if they couldn't use your ARC for their teen program (if they have one) and so forth--or maybe give it to a high school English teacher for their classroom's library. If you don't see something, ask. As they say, it doesn't hurt to ask and in 2011, this was how I was lucky enough to get Wolfsbane by Andrea Cremer at Midwinter. Use the app. Yes, there is an application you can download onto your smartphone and use for ALA. Honestly? It can be very, very useful. Conduct yourself in a professional manner. I don't care if it's the most popular title of the season, there is no reason to push, shove, fight, and so forth. Most of us are not ALA members and as such, are guests. Edited to add: Unfortunately I'm really busy this week and unable to update the blog quite as often as I usually do. I do, however, have a few posts scheduled. Also, I'm away at ALA this weekend! When I get back I'll be sure to do a wrap-up post but until then? Happy reading everyone! I'll have to look up the app---does it have an exhibit hall floor map? I think that's what I'm hoping for most, so I don't get lost! I'll definitely be on the lookout for you! :D And the app does indeed have the exhibit floor map on it--although it'll direct you to the website or download the pdf file onto your phone for you. I'll be there!! :) This is my first ALA so it should be awesome! I'm still thinking about going to the exhibits, but will have to see what work will have in store for me this week. Maybe I can swing Saturday and Sunday. Thanks for this post! It looks like I'll be able to attend on Saturday and Sunday and, though I JUST attended BEA for the first time, I'm not too sure what to expect from ALA. I'm glad to hear that there will be totes because I was already contemplating bringing my own, haha. great tips! this is my first year and i am super excited. thanks for the tips and hope to see you there!